This is a remarkable book. 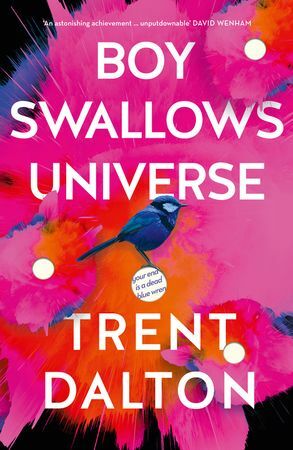 This is Trent Dalton’s first novel, and it’s a cracker. Set in Brisbane during 1983 and filled with an array of fascinating characters and heart-breaking moments, it will have you hooked straight away. Main character Eli lives a complicated life. His dad is gone, his brother doesn’t speak, his mum’s in jail and his stepfather deals heroin. Add then there’s his ex-crim mentor and the terrifying psychopath. Despite the mayhem swirling around him Eli tries wants to be a good man and to do the right thing. The writing is raw, moving, funny but most of all beautiful. This truly is a fabulous read. I loved Boy Swallows Universe as much as I loved Tim Winton’s A Shepherd’s Hut and Sophie Laguna’s The Choke. A highly recommended, extraordinary read.